Legacy IT infrastructure had challenges in offering flexibility and agility to Enterprises due to tightly coupled and vertically integrated hardware and software stacks with limited programmability resulting in complex and time-consuming provisioning and management activities. Growing hardware commoditization, the rise of X86 as the standard computing platform, advances in server and network virtualization technologies, decoupling of hardware and software, availability of standards-based interfaces and abstractions that provide lower-level functionality are increasingly making IT infrastructure to be software-centric. Thus, Software Defined Infrastructure (SDI) is rapidly becoming an architectural choice within the Enterprise IT organizations that are building next-generation infrastructure to realize higher business agility and reduce costs. SDI is a blend of compute, storage, network and security technologies where abstractions that provide lower-level functionality are exposed via programmable interfaces to orchestration, automation and management tools to create a highly automated infrastructure that ultimately enables consumption of IT-as-a-service (ITaaS). Software Defined Data Center (SDDC), Software Defined WAN (SD-WAN) and Hyper-Converged Infrastructure for Branch & Remote Offices are the critical components of SDI that span the IT infrastructure layers. SDDC further consists of Software Defined Compute (SDC), Software Defined Storage (SDS), Software Defined Networking (SDN) along with automation and management tools. 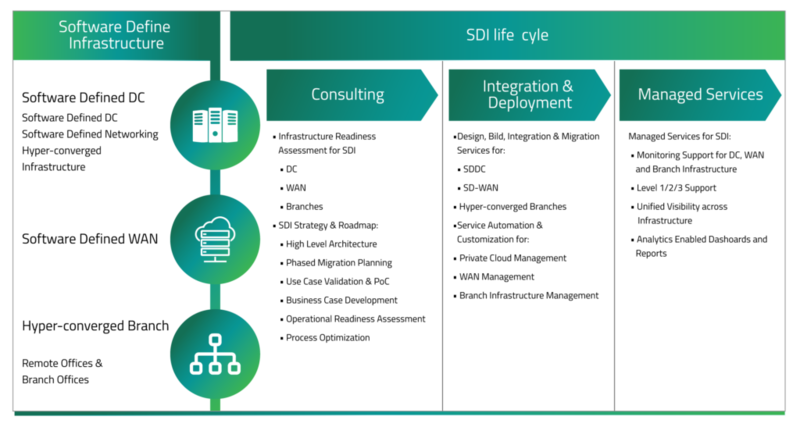 All these components of SDI have evolved in a reasonably independent manner resulting in a different technology maturity and adoption curve. With the increasing software control of the infrastructure, the IT organizations must address the challenges of evolving technology and vendor eco-systems, integration complexities, and convergence of technical skills that require cultural and process changes for successful adoption of SDI. Happiest Minds provides a full spectrum of SDI services for the Enterprises through its Consulting, Integration & Deployment and Managed Infrastructure Services capabilities coupled with partnerships with the leading vendors in the SDI space and product engineering expertise to enable Enterprises to reap the full benefits of SDI. Happiest Minds provides life-cycle services for Software Defined Infrastructure. Happiest Minds offers a comprehensive and end-to-end Cloud and DC Infrastructure services to ensure..